In the autumn of 1967 I was 26, and Wordsworth’s reaction to the French Revolution was not so dissimilar to mine when I learned the result of the Hamilton by-election. The event did not convert me to the cause of Scottish independence – that had happened six years previously – but it took that commitment out of a vague realm of quixotic idealism and transposed it into another of real, practical possibility, even if still a far distant one. It was for that reason a life-changing happening, plunging me into a number of years of intense political activism and many more of cultural nationalist activity, and having a far-reaching impact on my personal life. And such a story could be replicated countless times among Scots of my generation. It is hard to believe that “Hamilton” is now fifty years ago, and for younger generations part of comparatively remote history. It is as history that James Mitchell examines the by-election, its preparation, execution and consequences. With an Introduction and a Conclusion, his book has three substantive chapters. In the first he examines the political and economic background of the contest, and suggests how the securities and insecurities of the time were reflected in the attitudes of the political parties and affected the perceptions and behaviour of the electorate. The second chapter deals with the conduct of the campaign and the election itself, and this makes fascinating reading, particularly in exposing the wilful blindness and complacency of the established parties and their reluctance to recognise that something out of the ordinary was about to happen. It was not the politicos alone who were sleepwalking, though; the author makes much good use of the local newspaper the Hamilton Advertiser, which while wishing a plague on all the parties and supporting none of them, was wholly unable to envisage anything but a substantial Labour victory as a foregone conclusion. 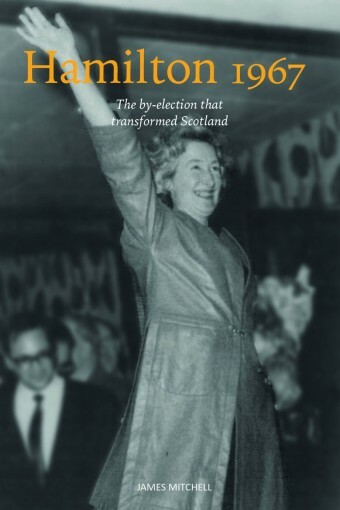 The third of these chapters concentrates on “The Fallout”, measuring the impact of the unexpected result on the established parties, on the growth of the SNP itself, on future by-elections and the 1970 General Election, and on the beginnings of the diverse moves to consider various kinds of constitutional change as a means of meeting the nationalist challenge. The Conclusion, finally, looks at the by-election in its historical context, both the long-term developments which led up to it and the complex consequences for the development of the SNP as a mature and highly effective political organisation and the long-term constitutional change which derived from that. Unfortunately this is not a particularly well-written book; it lacks sparkle and is marred by many incoherent sentences. It is also very poorly proof-read: many words are omitted, some of them crucial to the meaning of the text. One example must suffice. Harold Wilson is quoted as saying after devaluation that the “pound here in Britain, in your pocket or purse or in your bank, has been devalued.” No, what he said in his famous speech was that the pound in your pocket, etc., had NOT been devalued. It makes a difference. It is not the fault of the book (for it is not that kind of book that it is trying to be) that in spite of its thoroughness it misses something, that intangible sense of excitement not susceptible to analysis, which for so many made Hamilton an unforgettable and galvanising event. I remember its imaginative impact on the widest range of Scots (young Scots in particular) as being unprecedented. And it was the aggregation of such effects on individual lives and experience that came in the long run to modify the nation’s state of consciousness. Does it mention the impact of Gwynforb Evans winning the Carmarthen byelectionfor Paid Cymru just a year previously? Carmarthen proved that you could win against the UK party machine so what was its role in Hamillton? Given the critique I don’t think I’ll read the book, but I do share John’s memories of the excitement at the time that something was changing. I was 25, 6 months married, had just moved into the constituency and felt for the first time that my vote mattered. I later moved into the East Dumbarton constituency as it elected Margaret Bain and then followed her to Moray as Margaret Ewing. I may have to move if Moray doesn’t come to it’s senses next time around and re-elect Angus.